The British Wildlife Photography Awards recently announced the winners of its 2018 contest to celebrate the work of both amateur and professional photographers in capturing the beauty and diversity of British wildlife. 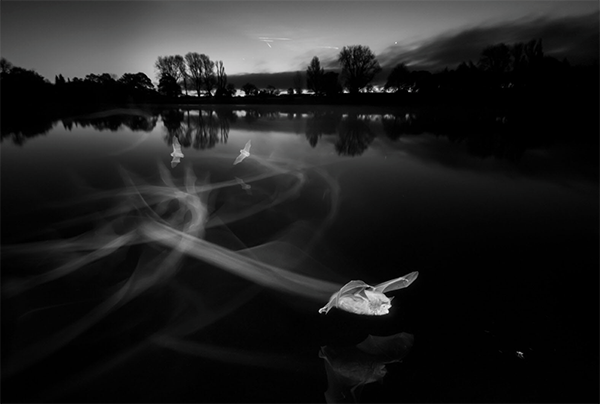 The top prize was won by photographer Paul Colley with his photo “Contrails at Dawn (Daubenton’s Bats)” captured at Coate Water Country Park, Wiltshire. Colley spent 14 months developing an infrared camera and lighting system to capture the high-speed flight of the bats in darkness. The photo is an in-camera double exposure that captured the bat in the foreground just milliseconds before it caught the insect seen right in front of it. Since the bats are a protected species, Colley photographed them in the wild with guidance from the Bat Conservation Trust and Natural England. “No other image in my portfolio had been so clearly conceived and yet so difficult to achieve,” Paul Colley said. “My artistic intent was to capture this extraordinary little bat’s speed of movement and hunting flight path, but the journey to success was littered with disappointing failures. Fortunately, fellow photographers encouraged imaginative experimentation and taught me to anticipate setbacks as a reasonable price for ultimate success.